Horses evolved on the American continents millions of years ago. They spread to other parts of the world thousands of years ago. Yet, by the end of the last ice age horses had disappeared from the Western Hemisphere. It wasn't until a few hundred years ago they reappeared, brought across the seas by the Spanish. These horses would be come an important symbol of the Americas for both invading Europeans and Native American nations. Horses had returned home. 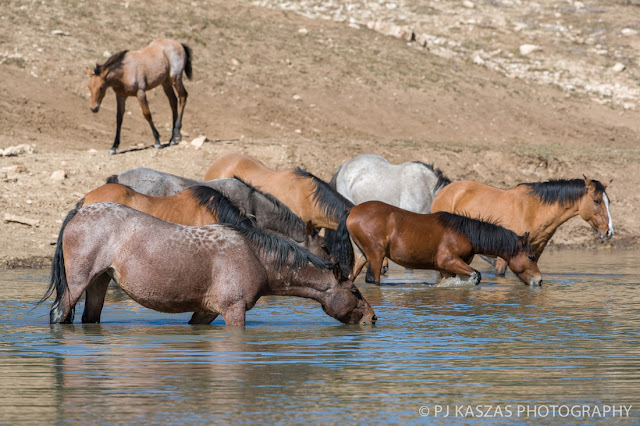 Today, wild horses in the United States live a tenuous existence. 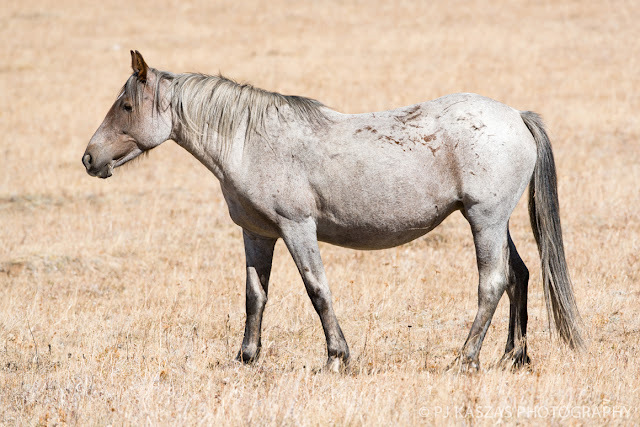 There are around 50,000 wild horses and burros in the U.S. The is an equal number that have been removed from their grazing lands and are held in BLM (Bureau of Land Management) facilities at the cost of nearly $43 million dollars a year. They are removed by lands during stressful and terrifying helicopter round ups. 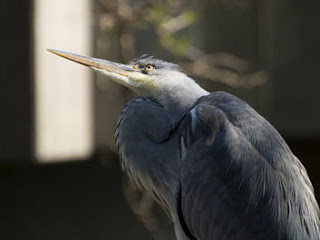 They are removed by bait trapping, which seems to be a much less dangerous method of removal. And populations are controlled by birth control (PZP as an example). 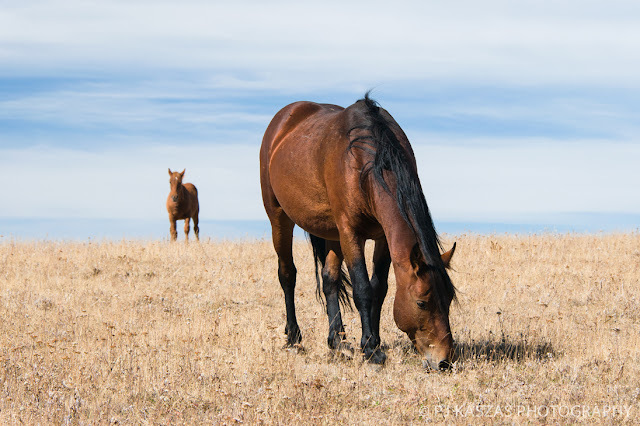 Yet, these horses still remain a symbol of freedom and the "Wild West" to so many in the world. Something is wrong here. 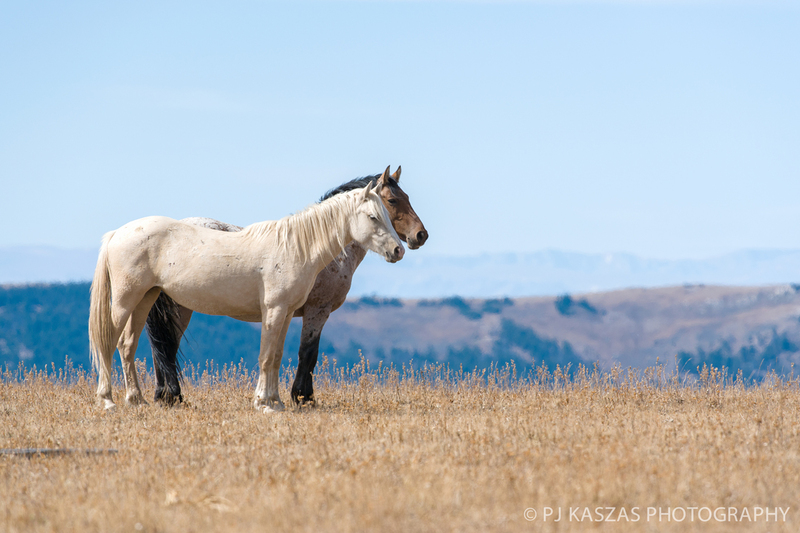 Myth and reality uncomfortably collide when you look into how the U.S treats wild horses. Knight and another stallion having a "conversation." I love horses. Some of my closest friends have been horses. Horse "therapy" (riding and caring for them) got me through some tough times. And many years ago I remember stumbling upon the documentary about a beautiful palomino horse named Cloud. This documentary was shot by Ginger Kathrens. Cloud, Wild Stallion of the Rockies is a remarkable documentary, as are the two follow up documentaries Cloud's Legacy: The Wild Stallion Returns and Cloud: Challenge of the Stallions. 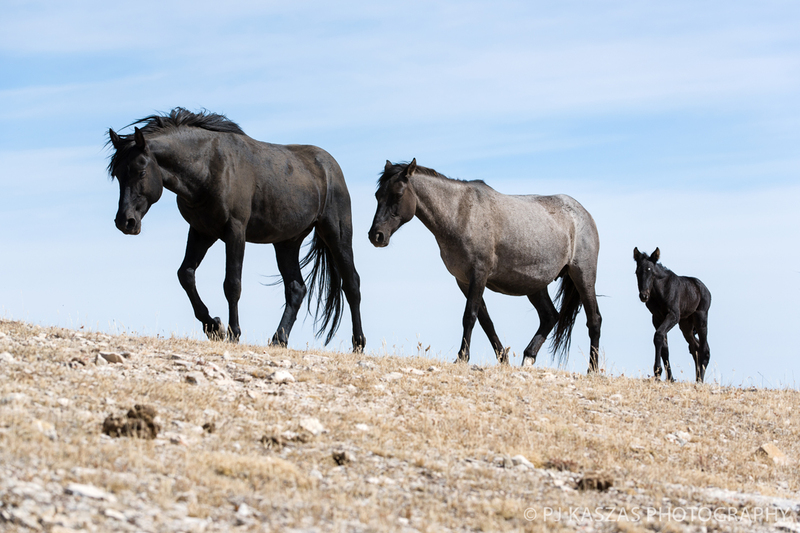 I've been following the lives of the Pryor Mountain mustang bands for years through these documentaries and the Cloud Foundation's Pryor blog. I've also been following them through Pryor Wild's blog. And then, last year, I started reading about the Dry Creak Quartet. I got really mad. I realized the only weapons I have to help fight such things from happening again are my camera and my writing. Encore (aka Nimbus) and Knight. Encore/Nimbus is Cloud's daughter. And thus I ended up going up into the mountains on the border of Montana and Wyoming with Traveler Thirteen to photograph these amazing animals, whose lives I've been following from thousands of miles away. And this day I got to see them in in person, to get just a tiny glimpse into their incredibly complex lives. 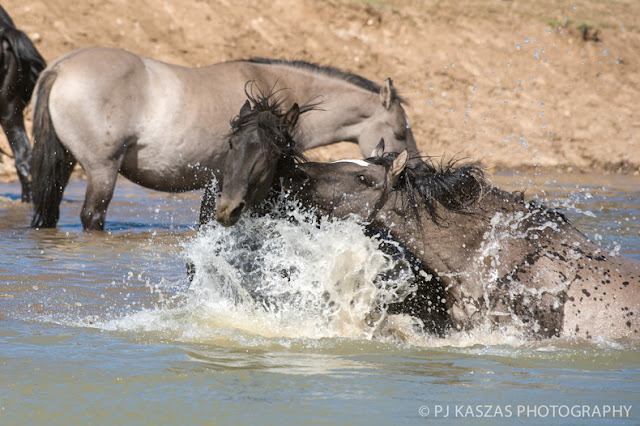 Horses, after all, are very social creatures and watching their interactions can be like watching the best soap opera, telenovela, and tense thriller ever produced. Band stallion Hamlet leading Audubon and little two day old Penn. We wouldn't see Cloud himself. He is now twenty years old and a bachelor. But we did see his mother, sister, sons (one born this year), and grandson. We got to see the amazing young stallion Hamlet defend his mares. We got to see Audubon, a member of Hamlet's little family, bring two day old Penn down to the water hole, perhaps for the very first time. We got to see beautiful Encore (also known as Nimbus), Cloud's daughter, and her stallion Knight. And we saw so much else as well. These are just a few images from the day. You can view the rest on FLICKR. Jasper/Jupiter going after Hamlet. This is typical band stallion behavior. You can help wild horses by donating to The Cloud Foundation. 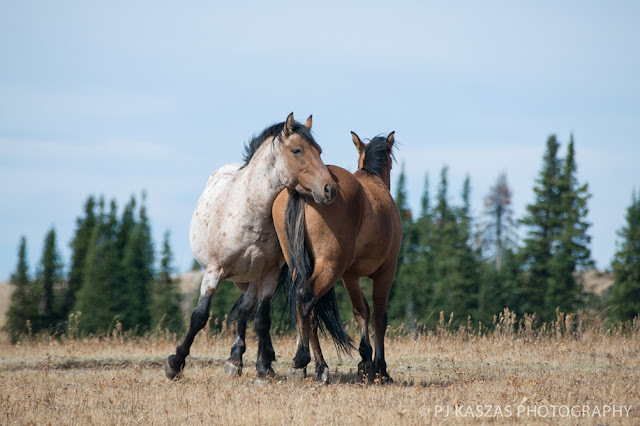 But its not just the horses of the Pryor range that need your help, there are horses all over this country that need your help. This is just one place to start. Peace returns to the watering hole.